Richard Osman has been trying to settle the most important issues society faces today. Who would win in a head-to-head between Quavers and Cheesy Wotsits? And What's the ultimate Christmas film (Home Alone, obviously). The World Cup of Everything is an incredibly popular format that began life on twitter where his hilarious polls received 1.5 million votes a go becoming a national talking point, inciting debate amongst twitter users at odds over their favourites, celebrities and key figures join in, bookies offer odds on the outcome, papers report on it all as if it is a real sporting event with headlines about how Richard Osman has melted the internet. 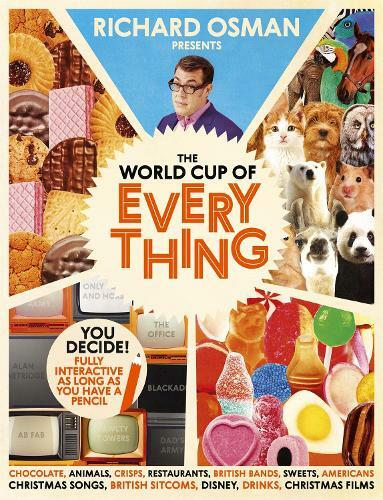 This autumn we're bringing The World Cup of Everything to the page in a brilliant book perfect for Christmas. With new competitions such as The World Cup of British Sitcoms, Christmas Songs, Animals, British Bands and so on, as well as some of the favourites that have already had the country talking: Chocolate and Crisps among them, Richard will offer commentary, share funny, quirky pieces of trivia and stand-up style entries about each of the contenders. The World Cup of Everything will offer something for everyone making it the perfect gift for pretty much anyone. This is Richard at his best: super smart, quick-witted and writing about the matters that the British public really care about. Watch our exclusive interview with Richard Osman where he discusses The World Cup of Books (including his own winning title) and answers the classic question: is a Jaffa Cake a cake or a biscuit?